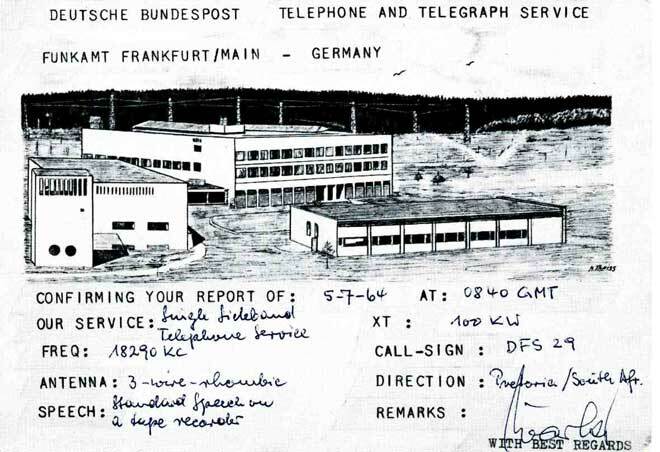 The shortwave transmitting station in Usingen, north of Frankfurt was operated by the german administration of posts and telecommunications (Deutsche Bundespost), and besides their own telephone and telegraph services, transmissions were made for other customers, too. German press agency DPA Hamburg used their transmitters, as well as DSV Köln and MFA Bonn. For signals in the longwave range, DBP was operating another transmitting station in Mainflingen, east of Frankfurt. From the many customers (KNA, DPA, epd, PIAB, VWD, DWD, ...) in the last century, only 2 are left until today: PTB Braunschweig with the wellknown time station DCF77, and EFR ripple control service on DCF49.